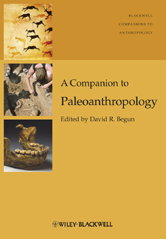 A Companion to Paleoanthropology presents a compendium of readings from leading scholars in the field that define our current knowledge of the major discoveries and developments in human origins and human evolution, tracing the fossil record from primate and hominid origins to the dispersal of modern humans across the globe. Represents an accessible state-of-the-art summary of the entire field of paleoanthropology, with an overview of hominid taxonomy. Features articles on the key discoveries in ape and human evolution, in cranial, postcranial and brain evolution, growth and development. Surveys the breadth of the paleontological record from primate origins to modern humans. Highlights the unique methods and techniques of paleoanthropology, including dating and ecological methods, and use of living primate date to reconstruct behavior in fossil apes and humans.